Mary Cain set a new World Junior Indoor 1000m Record with a time of 2:39.25 in Boston. A few mins later Galen Rupp smashed the American Indoor 5000m Record with a time of 13:01.26, the 7th fastest indoor time in history. US teenage prodigy Mary Cain broke the long-standing world junior indoor record for 1000m with a time of 2:39.25 at the Boston University Multi-Team Meet in Boston on Thursday night (16). 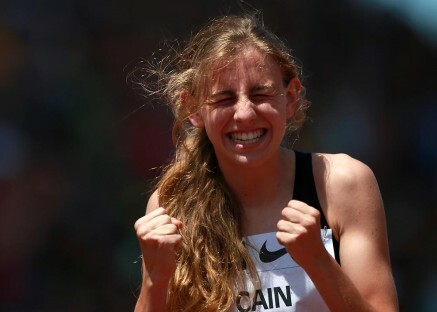 * Cain, still only 17 and one of the big favourites for honours at this summer’s IAAF World Junior Championships on home soil in Eugene, took just under a second off the previous mark of 2:40.1 which was set by the USA’s American Diana Richburg back in 1982. Cain came home in front of US 1500m champion Treniere Moser, who clocked a personal best of 2:39.32 for second place. The recipient of the 2013 IAAF Rising Star Award now holds the US junior indoor records for 1000m, 1500m, mile 3000m and two miles Her next target could be the world junior indoor record for the mile, which has stood at 4:24.10 to Ethiopia’s Kalkidan Gezahegne since 2010. Cain is expected to compete in the women’s mile in the Terrier Invitational, on the same Boston University track where she ran on Thursday night, on Saturday 25 January. Her current best for the distance is 4:28.25, when she set US high school and US junior indoor mile records at the 2013 Millrose Games. Galen Rupp, the London 2012 Olympic Games 10,000m silver medallist, broke Lopez Lomong’s US indoor 5000m record by almost six seconds, clocking 13:01.26. Rupp’s run was the eighth fastest performance ever and moves him up to seventh on the all-time list for the event. It was also the fastest run bu someone not from Ethiopia or Kenya. Kenya’s Sam Chelanga finished second in a personal best 13:04.35 with Rupp’s Canadian training partner, Cam Levins, third in a national record of 13:19.16.